By Leanne Tan in Artwork. Updated on December 4, 2018 . If there’s one skill dads of the world pride themselves on, it’s that they are handy with tools. From fixing the house’s plumbing to building the traditional tree house, it is a skill that can be applied to anything. It can even be said that a dad’s handiness with tools really shines when combined with creativity and innovativity. Take these 10 cool dads who use their skills to make costumes for their kids for instance. These are the dads who won’t settle for a store bought costume, choosing instead to give their kids a unique outfit that would be the highlight of their childhood. There’s no doubt that a father’s love and creativity knows no limits when it comes to these costumes. 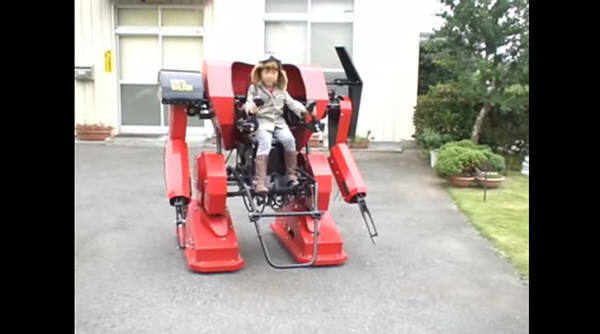 Many were jealous when they saw what this Japanese father built for his daughter: a fully functioning mech suit. And no, it’s not made out of cardboard. It actually looks like an honest-to-goodness robot complete with metal and wires. Whatever this dad does for a living, he definitely has skills as you can see from this video, where his kids are gleefully playing with what looks like a plane machine and a shooting tic-tac-toe game. This dad is cool personified. Glowy Zoey is the nickname given to this precious little girl in a LED costume her dad made. This year he decided to up the ante by improving the costume with Minnie Mouse ears and lights that change colors. That’s not all there is to the costume as apparently the lights respond to sound. 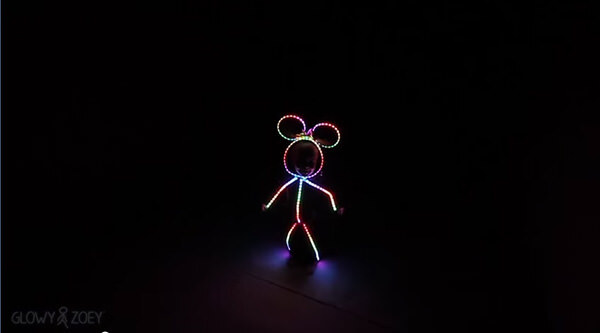 Who knew watching a little girl running around as a stick Minnie Mouse in the dark could be so adorable? Technically, Eric Hart only constructed Iron Man’s mask but it was definitely well-done. Born premature, Eric’s son Collier has been hooked up to tubes and wires since birth. 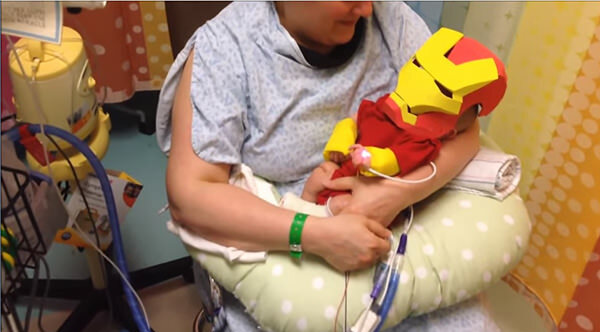 As a way to instill some courage in that little body and to celebrate Halloween, the professional propmaker set about constructing Iron Man’s mask out of foam which you can watch the process here. Stay brave there, young Collier. At first glance, I thought this was a life-sized LEGO minifig until I saw the kid inside the costume. 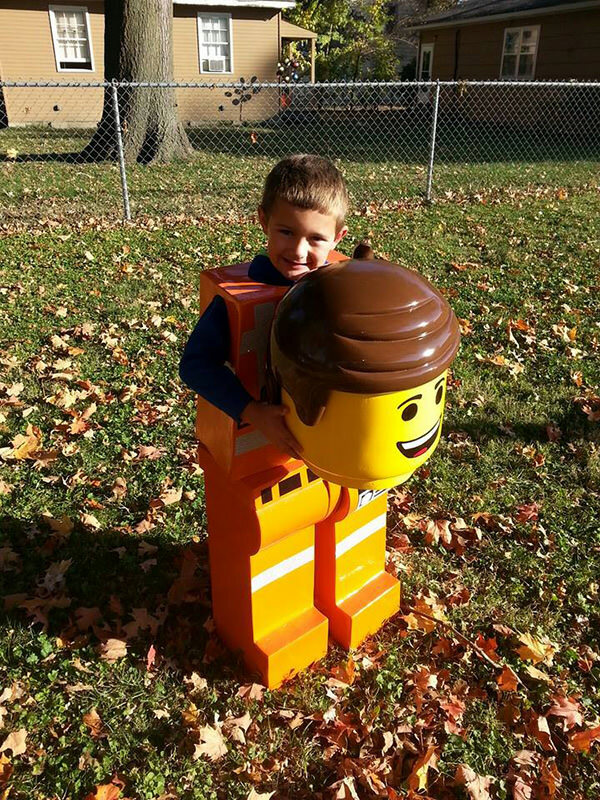 Drawing inspiration from the LEGO Movie, this boy’s dad, who works as a factory machinist, painstakingly crafted this extraordinary costume in time for Halloween. Although when wearing the costume his son can’t bend his knees, you have to admire this father’s amazing craftmanship. Check out this article for more pictures of the LEGO costume. Stepdads are dads too and contrary to popular belief, not all of them are out to make life miserable. In fact, the ones worth mentioning make life worth living. Like this dad who wanted his wheelchair-bound stepson to enjoy Halloween at its fullest. 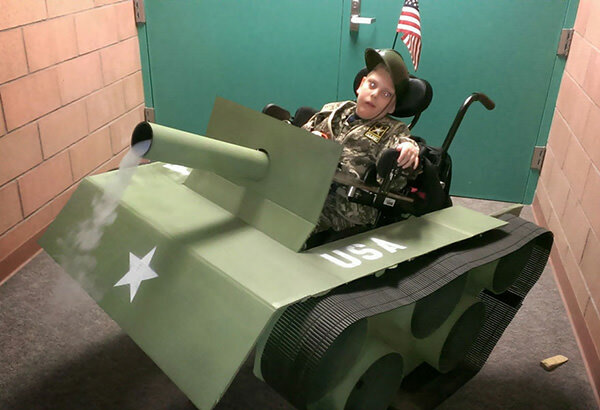 So he poured all of his love and time to constructing a tank costume around his son’s wheelchair. A father’s ingenuity knows no bounds. Tom Burns’ costume-making skills may not seem like much compared to the other fathers on this list, but he deserves all the awards for instilling an important lesson in his daughter: She can be anyone she wants to be. 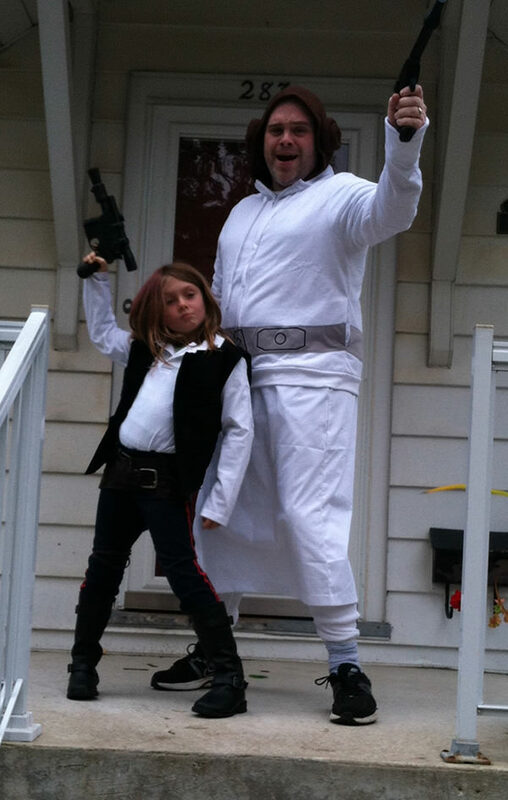 This came about when he was watching Star Wars with his daughter when she turned around and asked, “Do you think I could be Han Solo for Halloween?” Tom said yes, helped put together her Han Solo outfit, and became Princess Leia to accompany her. There’s nothing better than a father who actually walks the talk. In style. 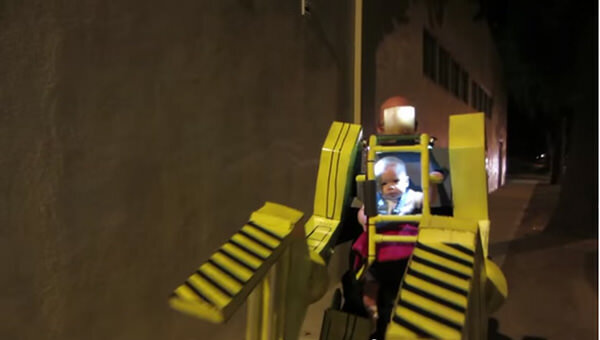 Dads who create costumes around their child’s wheelchair all deserve special mention. Take little Carter’s dad for example. Inflicted with spina bifida, Carter has to use a wheelchair to get around. And that includes trick-or-treating for Halloween. 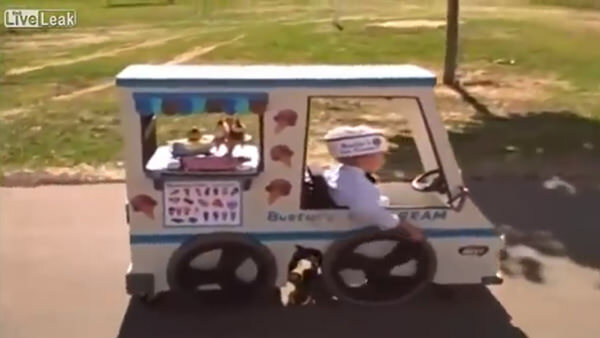 Thus, Carter’s ice cream truck costume that comes with back wheels and even an elaborate window display. Watch little Carter wheeling himself happily to collect his sweets here. Humans can’t be a Transformer, you say? 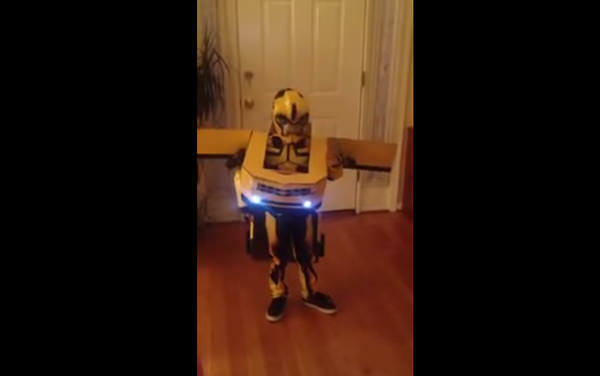 Well, this dad just proved you wrong as he sets about turning his son into Bumblebee. It’s an impressive construction piece made from cardboard complete with flashing lights. Make sure you watch the video to see how this little dude transfrom from unseeming car to an extra-terrestial robot. Michael Bay, sign this kid up (and his dad) for your next movie! Reddit user bzzltyr has been creating elaborate wheelchair costumes for his daughter who has a rare condition called schizencephaly. He has been doing it for years so that she could join in the Halloween fun. This year was no different as he decided to go with the theme of Pixar’s movie ‘Up’. 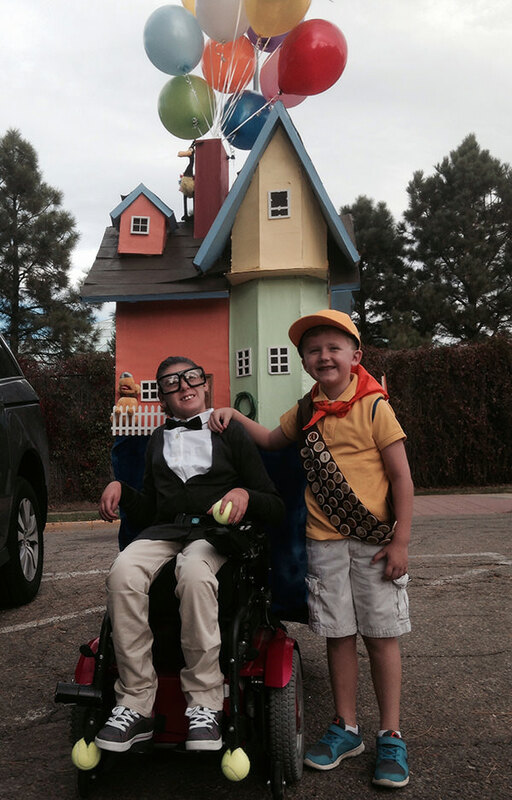 The girl’s brother, who has been her constant Halloween partner, dresses up as Russel to her Mr. Fredrikson while her wheelchair is a spectacular mobile house complete with balloons. Dads don’t only bond with their kids by making their costumes, they share costumes with them too. Just take a look at Jason Smith and his baby daughter. Taking inspiration from the movie Aliens, Jason set about building this Power Loader robot suit with space for his daughter to sit comfortably in the front. This creative dad is creative as he is practical, designing the suit for mobility and a quick exit in case of emergencies. Watch the suit in action as Jason and his daughter strolling along the streets here.